Welcome to the easy and affordable portable baptism pool designed to be easy to assemble, durable under use, and very compact when dis-assembled. The BaptEZ is ideal for all your portable baptistry needs. 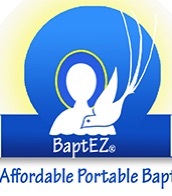 The BaptEZ portable baptismal pool is ready to meet all your needs - and all for one low price. We start with a poly-reinforced material that is similar to what the military uses for its inflatable boats, giant tents as well as those giant air blimps you see circling around sporting events. This advanced material uses new Rip-Stop™ technology that prevents ripping and tearing in the unlikely event you get a puncture. And if you consider the number of people who will be getting in and out of your portable baptistry pool, you will be grateful for the presence of this highly durable material. Your BaptEZ portable baptismal pool is so versatile as a result of its durability, that you can place it on any type of surface: grass, asphalt, concrete, pebbles, brick, sand or any combination. The ground does not to be perfectly flat or level either. Your BaptEZ can easily tolerate being over five inches out of level. The BaptEZ is also designed based on years of experience with portable pools that are built to support as much as a 100 times the water weight used in a BaptEZ. And with BaptEZ you have a choice of nine (9) colors to choose from as well as a no-charge modification. So if you need it to be smaller than listed, there is no charge to modify to fit your needs. 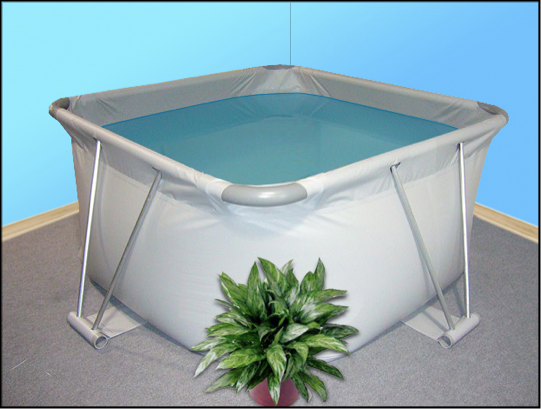 This portable baptism pool can also be folded and packed into a small 4' long x 1' x 1' box. Making it very easy to transport, store and carry. This is the ideal baptism pool for portable baptistries or churches that are doing missionary work through rural parts of the world. The unit also provides the optional drain plug that allows you to simply unscrew the plug and drain the water out. You can also attach a regular garden hose to direct the draining as you please.